Mancala Wooden Traditional Game may well be the oldest game in the world and is believed to have originated in Egypt and later spread throughout Africa where it is still played today. Different versions of this strategy game can be found all over the world and there are many different rules but the strategy remains the same. This counting game is wonderful fun and has a very interesting logic to it that helps develop maths skills. 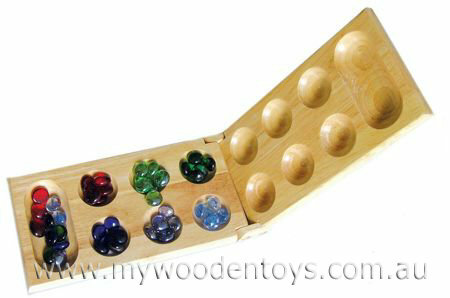 Mancala comes in a varnished, folding, wooden box with colourful glass playing pieces and full instructions. We like this because: "My wife and I love playing this game. I first played it in Africa and was totally wiped off the board by a 10 year old!"